17" x 18.25" x 6.75"
Greetings! Let me begin by wishing you all a happy, healthy and prosperous new year. In the world of glass art, this year is significant as it marks the 50th anniversary of the studio glass movement (more below on this). I know that many of you began collecting in the 1980’s and 1990’s. I’m wondering if any of you acquired your first glass art piece in the 1970’s. I’d love to hear from you if that is the case. To start off the new year right, I’ve chosen some wonderful new works (and a couple of older ones) by some of my favorite artists. I hope you enjoy this letter and look forward to hearing from you with comments or questions! This is a new piece from the “Kira” series that Lino started last year. The combination of swirly colors and the deeper than usual surface cutting make this an exceptional piece. In my opinion this piece has some of the most complex and interesting cane work that Lino has ever done. This month I chose a “classic” Powell piece from Stephen’s archives. I have always loved the simplicity of this early series (which he refers to simply as “bulbs).” This particular piece is typical of Stephen’s work of that period in that it has very large murini. I love the colors in this piece and am particularly drawn to the turquoise and aqua murini. I received the image of this beautiful new vessel by Jose only this morning. I love the earth tones of the exterior and the contrast of the apple green interior which we get just a peek of in this image. The linear elements of the exterior are organic, lyrical and elegant. From time to time I have access to a piece from this signature series by Preston which he officially stopped creating just about a year ago. The symbolism suggests the narrative of one of the most famous Raven stories in Preston’s native Tlingit culture, Raven Steals the Moon. In addition to the Chihuly Studio Editions from 2011 which are pictured on my website, there is a limited quantity of some of the earlier Studio Editions still available. 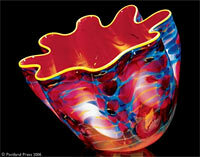 One of my favorites of these earlier series is “Pacific Sunrise Macchia” which was created by Dale in 2007. The colors and lines of this piece indeed bring to mind the colors of a sunrise (or sunset) as seen particularly from a South Seas island. It’s very exciting to me that we are celebrating 50 years of what was originally called studio glass and which I now refer to as contemporary glass art. 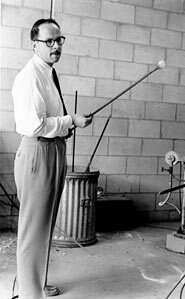 It was in 1962 that Professor Harvey K. Littleton collaborated with scientist Dominick Labino in Toledo, Ohio, to create the first small glass furnace that would allow an individual glassblower to create pieces without access to a larger facility such as a glass factory. As many of you know, Marvin Lipofsky and Dale Chihuly were among the first graduate students in Littleton’s first MFA program in glass art at the University of Wisconsin in Madison. From there they went on to create their own programs in glass at California School of Arts and Crafts (Lipofsky) and Rhode Island School of Design (RISD-Chihuly) and taught many of the leading artists in the field today. Much of the early work in the 1960’s and 1970’s was experimental but by the early 1980’s many glass artists had developed work which was quite sophisticated in both technique and style. We owe a great debt of gratitude to those early pioneers of glass art who paved the way for the world of contemporary glass that we all know and love! I hope you have enjoyed this month’s newsletter and that you are all having an excellent start to the new year!